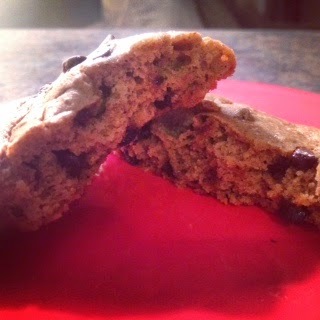 I know the idea of chickpeas in your cookies is kinda gross, but trust me, you will want to give these cookies a try!!! Once you get the chickpeas blended well and mixed into the batter you can't even taste them! Chickpeas make a wonderful base because their texture allows you to omit the flour and butter, all the while adding plenty of fiber - so you don't have to feel so guilty if you eat more than one! 2. Line a baking stone with parchment paper. 3. In a Magic Bullet (or blender) add chickpeas and blend very well until all lumps are gone. 4. In a large bowl mix together chickpea base, almond butter, vanilla extract, egg, salt, baking soda, and brown sugar and mix well until all ingredients are combined. 6. Drop by spoonfuls onto parchment paper. Place in oven and bake for 8-10 minutes. Take out and let cool.